Complete at least one Tiger elective adventure of your den or family’s choosing. With the help of your parent, guardian, or other caring adult, conduct a science demonstration that shows how magic works and share what you learned from your science demonstration. Make a family tree for your particular family. 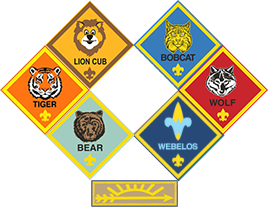 With your den, parent/guardian, or other caring adult, say the Scout Law. Explain to your den one of the 12 points of the Law and why you think a knight would have the same behavior. With your den or parent/guardian or other caring adult, try on safety gear you should use while riding a bike. Show how to wear a bicycle helmet properly. With your den or parent/guardian/other caring adult, learn and demonstrate safety tips to follow when riding a bicycle. With your den or parent/guardian or other caring adult, do a safety check on a bicycle. With your den or parent/guardian/other caring adult, discuss two different types of bicycles and their uses. Visit your local or state police department to learn about bicycle- riding laws. With your den or parent/guardian/other caring adult, go outside to observe the night sky. Talk about objects you see or might see.